Human Rights Law creates controversy, contention and counter-point like few other legal areas. 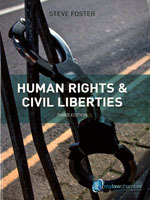 Human Rights and Civil Liberties is a clear and comprehensive guide to this rapidly developing subject, and covers the enforcement of human rights and civil liberties generally, before examining the protection of specific areas of civil liberties in domestic law including (among others): the right to life, freedom of expression; the right to demonstrate; privacy; and freedom from torture. The book places the study of the subject within the context of the passing and implementation of the Human Rights Act 1998 and the principles and case law of the European Convention on Human Rights, providing you with an unrivalled framework to deepen your understanding of the area. 1. Civil liberties and human rights: definition, classification and protection. 9. Press freedom and freedom of expression: defamation, confidentiality and contempt of court.